The Château Pradeaux in Saint-Cyr-sur-Mer is a monument of history and viticulture! Jean-Marie-Étienne Portalis inherited the property in 1752. He became a historical figure and later became negotiator of the Concordat, then co-editor of the Civil Code under Napoleon I. The Portalis family crosses all the eddies of history without ever abandoning its vineyard adventure. At the end of World War II, the Château Pradeaux was devastated. Arlette Portalis and her mother Suzanne rehabilitated the estate, refocusing it on the Mourvèdre and the Bandol appellation. Today, it is Cyrille Portalis and his sons Étienne and Édouard who manage this emblematic domain of the wines of Bandol. The Château Pradeaux vineyard covers 26 hectares of clay-limestone soils facing the Mediterranean. The Mourvèdre grape reigns supreme on this terroir, bringing to the red wines a power and a potential of guard exceptional. The red wines Bandol of Château Pradeaux open slowly; A unique character that presupposes keeping them in the cellar 10 years or more, with the promise of a good tasting. 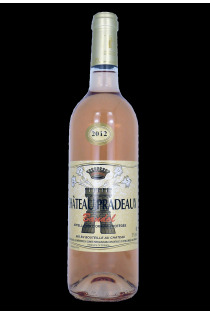 The Château Pradeaux also develops rosé wines in the Bandol appellation, absolutely remarkable for their delicacy. The Château Pradeaux also produces wines in the Côtes de Provence appellation and wines from Pays du Mont Caume. 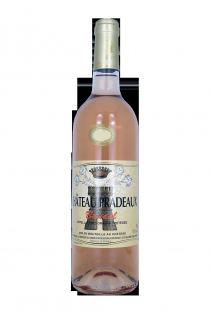 The wine produced at Château Pradeaux is the heir of a long history. Each generation has its imprint, while respecting the spirit of the family tradition of Bandol wines. The wines of Château Pradeaux require patience and experience: they are revealed after several years of guarding. The vine growers work the vine manually and mechanically, and practice exclusively manual harvests. The vinification is done in whole clusters: a technique that is well suited to Mourvèdre because the grape of this varietal is not herbaceous. The farms, impressive in their duration, give Bandol red wines to the record keeping potential and Bandol rosé wines recognized for their depth.